is this violin hold correct?. 3 years ago I would have said yep, no question! Now I have question(s). 1. Does it feel comfortable and stable? To me it appears you have no shoulder rest and arent using any padding at all. It also seems to me that you are holding it relatively parallel to the floor and are not straining at your neck to hold it in posistion. I think these are all good attributes of a hold that can work for you. 2. What do you dislike about your bow hold and or violin hold? 3. How do you think you should adjust your holds, and have you tried adjusting them? 4. Do either of your holds limit or prevent free movement and playing? 5. Do you feel any tension in your body when using your holds? This is my basic run down thought process now adays. One of the kids I work with has a challenge with his bow hold and bowing wrist. He is in the 7th grade and has some motivational issues and "sloppy" technique sometimes. Its funny when you catch him on it and he perks up like you just solved the rubiks cube for him. He is like oh yeah, I always forget that... So, for you my advice is reevaluate your holds everytime you play so you dont forget a key part, until its habitualized correctly that is. keep at it, learning is a marathon not a sprint. One thing I did noticeI was that your bow hair tension may be a bit low. At times your bow hair looked as you it where touching the center of the bow. I could be wrong but that is the way it looked to me. I would also try moving the peg end of your violin a little more to the front of you. Also try tilting your violin down a little on the E string side. 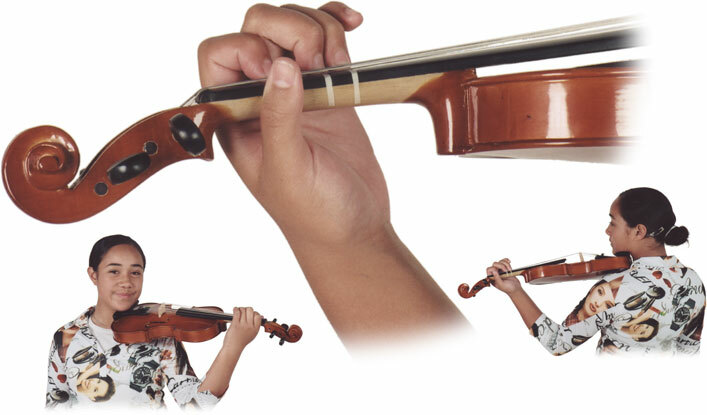 You wont have to lift your bow arm as high to reach the G string. Give it a try. It can't hurt. now, you have one that most common problem to many violin players, to which I admit that I also had that problem at the beginning until I found that problem and fixed it permanently, the problem is that the violin's neck is resting on your wrist, that is a common habit that can be easily fixed, if you don't do it right, you will find it much harder to use vibrato. Everybody's anatomy is somewhat different, so there isn't an exact universal way to hold the violin. But unless there is something unusual in the way you are built, you might expect your hold to be similar to the holds of the good players you see on youtube. But I hope you can see that it is quite different. The most obvious difference is that you have the scroll off to the side, as Ferret stated. The neck of the violin should make an angle closer to 45° with your shoulders, so the scroll should be out in front more. Just about as obvious is the way you have your head turned off to the side. You should be looking forward a lot more. Third, I notice how you are lifting your shoulder to hold the violin. It looks like that can't be comfortable or sustainable or good for your health. I think all three problems are coming from not using a shoulder rest. BTW I think you are getting good sound out of the violin, so I think getting set up better (bridge adjustment and shoulder rest, for sure) is more important than getting a new violin right now. First thing I noticed is when you put up your violin you lift your shoulder. While you may be used to this, it will cause problems, pain and discomfort in the future and keeps you from being completely relaxed. You need to add at least an inch to that chin-rest or use a shoulder rest (can't believe I'm saying this) to keep from having to raise your shoulder. It will pay off in the long run. When you make the change, you will need to consciously think about relaxing and not raising the shoulder on a regular basis since you are used to it.